A mother goes missing in Texas. Two young kids left home alone. Mom and dad aren't there, and when the front door opens again, only one parent comes back. What happened to Bianca Carrasco? Disappeared? Or gone by choice? Family secrets and alleged affairs -- Crime Watch Daily searches for answers from the one person who may be able to help solve the mystery. 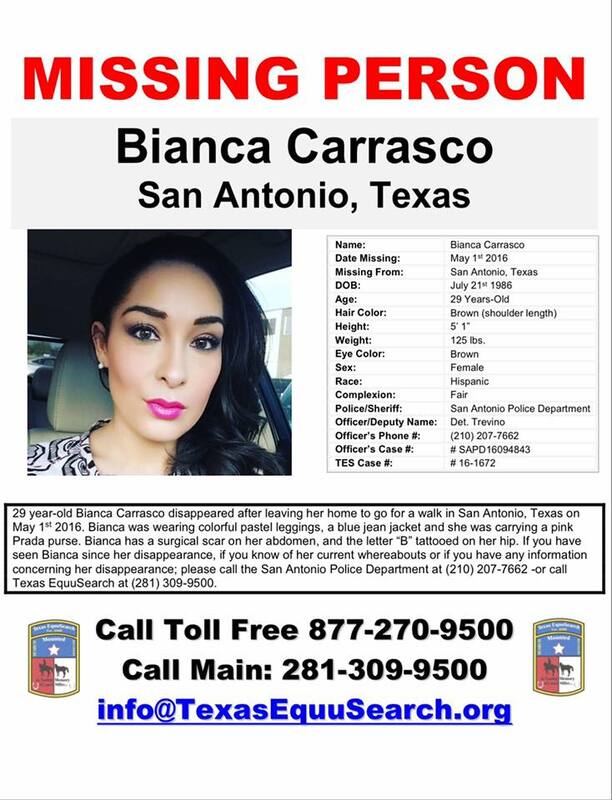 Bianca Carrasco was 29 when she was last seen in San Antonio on May 1, 2016. It's been almost a year since Jovanna Burney last saw her sister's face, a year since she heard her voice on the other end of the phone. And according to Bianca's family, she was doing her best to laugh through a lot of tears not long before she went missing. She was reportedly in an unhappy relationship with her husband. "Bianca and her husband Joe Daniel were married for almost 10 years and they were struggling in their marriage," said CBS7 Reporter Alexa Dunson, who covered the story. "She was kind of done with the relationship, from my understanding." Bianca was only 18 when she married Joe Daniel Carrasco, 11 years her senior. And even though they would go on to have three children together, Bianca's sister, Jovanna Burney, says it was never a very perfect union. "Bianca was 18, and actually Joe Daniel was her uncle," said reporter Alexa Dunson. "Daniel was married to my sister Brenda," said Barbara Talamantez, Bianca's mother. "They have an 18-year-old daughter. Daniel and Brenda were going through a divorce and kind of to get back at her, he started wooing Bianca. Bianca gets pregnant, they get married, and I think, just to out of malice, just to get back at my sister." Barbara says that Joe Daniel had become something of a family wedge. "Daniel very much manipulated trying to keep Bianca away from all the family, he tried to keep her away completely," said Barbara. "The last time I saw Bianca was probably five years ago. Bianca and I were not on speaking terms when she went missing. I blame Daniel for that." But family also say that as Bianca and her children got older, she started becoming more independent. "She had just graduated in October as an RN," said sister Jovanna. "I was so proud of her, to see her in October walk across that stage, she was proud of herself. And good for her, and I was proud of her." Mother Barbara also says that around the same time as that graduation, school wasn't the only thing Bianca was ready to leave behind. "Bianca had asked Daniel for a divorce, if you look on her Facebook, she had already listed herself as divorced," said Barbara. "She was already, I guess, beginning to live as if she was single." "Bianca was talking to other men -- one man in particular," said reporter Alexa Dunson. "I think she was communicating, like, on her phone and social media outlets," said Jovanna. "I think maybe she's met with one of them once or twice. But it was nothing serious. I had a conversation with her about it, and I just kind of told her like, you know, 'Y'all have been married for a long time, it probably feels good to have the attention from him,' and she was honest and said that 'Yes it was.' And I just told her, like, you know, don't let it consume your life, you know, because you don't know what kind of trouble this can cause." How long it had been going on, no one could say. But eventually Joe Daniel found out. And according to Jovanna Burney, Bianca's sister, that was just a few days before she disappeared. "The Wednesday before she went missing, she was scared, he was angry. He had just found out about her communications on her phone, who she was talking to, other males, and she was scared," said Jovanna. Bianca Carrasco is missing, and the family of the mother of three fears the worst. Bianca Carrasco was 18 when she married her former uncle, Joe Daniel Carrasco. She was 29 when she said she was through, started seeing someone else, and according to family, Joe Daniel found out. "Of course he gets in her phone and he sees that there was a specific one that she talked to," said Barbara Talamantez, Bianca's mother. "That was a Wednesday." After that, Joe Daniel Carrasco took drastic action, according to a text reportedly sent from Bianca to her sister Jovanna that reads: "Daniel emptied the account and opened another account without my name on it, so I have no access to money except my credit card which is almost at the limit." "I will not be controlled by a man and money." Four days after that, on Sunday, May 1, 2106, Jovanna Burney spoke to her sister for the last time. "She talked about going to see a lawyer. We talked a little about the kids, what was going to happen with them, and she wasn't too sure because he wanted the kids, and they were kind of arguing about that," said Jovanna. "The positive is that I did get to tell her that I love her." What happened after that is now part of official police record. "Bianca Carrasco was last seen on May 1st, which was a Sunday night," said CBS7 Reporter Alexa Dunson. "What we know is that her and her husband, Joe Daniel, got into an argument over her speaking to another man, over her possibly wanting to leave him. She walks out the door and goes down the street. Joe Daniel picks up their youngest child, puts her in the car, drives past her, leaves the other two children in the house." And then, Bianca was gone. It wasn't until late the next day that Jovanna found out. "Monday about 4 o'clock was when he let me know that they had gotten into an argument and that she walked away from their house," said Jovanna. "And I said 'Where are the kids,' and he said 'The kids, they're at home.' They were left alone." "So she just kept walking and left the kids? That doesn't make any sense. I called her phone. Well, her phone was off -- totally out of character, she's never turned her phone off," said Jovanna. "There is something seriously wrong." Then, after discovering that Bianca never showed up for work, Jovanna texted Joe Daniel: "Can you call your aunt and ask her if she's talked to Bianca?" Joe Daniel responds: "No sister, just let her be for a little bit." Jovanna: "She still doesn't have her car?" Joe Daniel: "No probably using that guy's." "He said 'She probably left with one of those guys,' and my reaction to that was 'Leaving her kids, with no car, that's not my sister.' At night -- just, it's not her, not her at all," said Jovanna. Jovanna took action, texting Joe Daniel: "On the other line. I called the police." Joe Daniel responds: "Call me when you're done." Instead, Jovanna meets with police officers to tell them what she knows. "Something that just sticks out in my head is that one of the police officers, he asked me why hasn't the husband called, and I said I don't know, I don't know, and he said 'Well, give me his number, I'll call him,'" said Jovanna. "And he calls him right in front of me, and he lies and says he has the wrong number." After that, Joe Daniel reportedly called police himself and finally made a report. "So then I believe it was that night they finally listed her as a missing person," said Jovanna Burney. Then police bring the husband in for questioning. "In these cases, one of the first things we look at the immediate loved one or the relative of the missing person," said San Antonio Police Officer Doug Greene. "Mr. Carrasco has been cooperative with our investigators. It's our understanding that he thought that Ms. Carrasco was going to return home, so he didn't raise really any concerns and felt the need that he needed to make a report." Joe Daniel told police about Bianca's alleged affair, and officers follow up by questioning the man. But no suspects were announced, and no clues to Bianca's whereabouts have been made public -- in fact, no evidence of any crime at all. "Some people, they go missing, they're adults, they just don't want to be contacted," said Officer Greene. "At this point we haven't had anything to show concretely that there was foul play involved," said Greene. But after nearly a year of searching, police say they have assigned a homicide unit to the case. Crime Watch Daily Odessa, Texas affiliate CBS7 tried hard to get a response from Joe Daniel Carrasco. "Of course I wanted to hear his side of the story, reached out to him several times," said reporter Alexa Dunson. "The first time I called him, he said it was in fact Joe Daniel. Every time I told him who I was with or what I was trying to do, he hung up on me. And then the last few times I called him he told me I had the wrong phone number." Dunson was able to get an interview with Joe Daniel Carrasco's attorney, who denied any involvement in Bianca's disappearance. "He has been active in the case. He has attempted to work with DFPS [Texas Department of Family and Protective Services], and the focus for him and for all of us working the case is to protect his kids. That's our concern right now," said Joseph Hoelscher, Joe Daniel Carrasco's attorney. Crime Watch Daily wanted to give Joe Daniel Carrasco his say. Dunson said Joe Daniel was living in Odessa with the couple's three kids. After first trying to reach him by phone, Crime Watch Daily found an address. Someone who answered the door said Joe Daniel was at work, and that Crime Watch Daily could come back when he was there. When CWD returned, we were told to stay away. Days later, we flew back to West Texas, where that night we found Joe Daniel sitting in his car. He refused to comment. Joe Daniel Carrasco's attorney, Joseph Hoelscher, gave us the following statement: "The Carrasco family is deeply grateful for the kind thoughts and prayers of so many people as they continue trying to adjust to their new lives. Joe and the children remain hopeful for Bianca's safe return." For now, the case remains open in every sense of the word. "We're not ruling anything out in this case," said Officer Greene. "There could be some foul play involved. It's our hope that we can get some more information, hopefully from the public or from anybody else that knows anything about this case or Ms. Carrasco's whereabouts to help us find out where she is, because we know that the family is grieving." And to that, there is no dispute. "Just let her pick up the phone and tell me she's OK," said Bianca's sister Jovana Burney. "I miss her really bad, really, really bad, and I feel like I've lost a piece of me, like a piece of me is gone, and I'm trying to figure out how I'm going to get through life without her." Bianca's family has created the Help Find Bianca Carrasco Facebook page to help bring her home. Bianca Carrasco stands 5 feet 1 inch tall and weighs about 125 lbs. She has black hair and brown eyes. She also has the letter "B" tattooed on her hip. If you've seen her or have any information where she might be, please contact the San Antonio Police Dept. at (210) 207-7662.